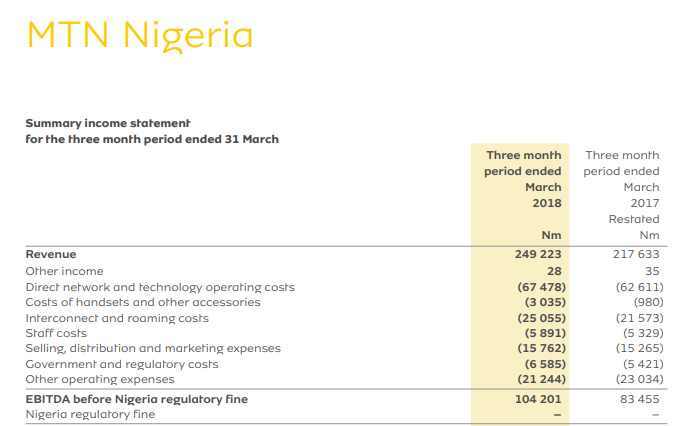 Here, relying on the Q1 2018 MTN Group financial reports, I present the extracted numbers for MTN Nigeria. MTN Nigeria made N81.4 billion (about $225.7 million using reported exchange rate) in the first quarter of 2018 on its 54.5 million subscribers. MTN Nigeria continued with the positive momentum of 2017, increasing service revenue by 14,4% YoY, led by a 73,2% increase in data revenue and 15,2% growth in voice revenue. While the increase in voice revenue was encouraging, it was supported by the lower customer spend on VAS. As growth in our digital services is expected to resume in the latter part of the year, this may impact growth rates in voice revenue. MTN Nigeria reported net additions in the quarter of 2,3 million following on from the 2,0 million adds in 4Q17 as the business benefited from the increase in our SIM registration footprint. To help me understand the impact of WhatsApp and other OTT solutions, I pulled MTN Group financial report in 2006. In 2005 (yes 2005), MTN Nigeria was recording ARPU of $22. Today, it is $4.14. Sure, competition has a huge role there but I do think the OTT services are largely to be blamed. When the ARPU dropped to $18 in 2006, we already had Glo and Airtel (you take the name, Econet, Zain, Celtel etc). So, the reduction of ARPU is not just on direct industry competition, the OTT is having a real effect. Nigeria In an exceptional performance, MTN Nigeria increased its subscriber base by 47% over the prior reported period, recording some 3,9 million net connections for the year with more than 12,3 million subscribers at year-end. In addition, MTN Nigeria recorded market share of 46% and reduced churn levels from 35% to 30%. This performance was largely due to the successful introduction of a segmented value proposition and distributor campaigns. ARPU declined by 18% from US$22 in the prior year to US$18, consistent with increased penetration and reflecting the continued acquisition of subscribers at the lower end of the market. The MTN Nigeria numbers are not necessarily great. As they share more financial information for the expected listing on the Nigerian Stock Exchange, we would understand this business better. Honestly, I had expected MTN Nigeria to be closing at least N100 billion per quarter on revenue. This WhatsApp thing is indeed real, I must note. Generating N81.4 billion from 54.5 million subscribers every quarter is not that stellar after all the campaigns, bonuses, promotions, etc. There is something fundamentally missing in the purchasing power in Nigeria. That people spend mere N500 on phone and data services per month (for the total of N1500 quarterly), on average, on MTN ecosystems, means the real talking should focus on economic empowerment. Who knows what is happening in Glo, Airtel and 9Mobile if MTN Nigeria looks this way? You can download the MTN quarterly result here. MTN Nigeria responded informing me of this link. In that link, the company made a service revenue of N248.3 billion for Q1 2018. I have asked them to correct what was published in the Johannesburg Stock Exchange financial report as both do not align. These are some comments from LinkedIn feed of this piece. Too many things to deduce from the piece, but I will keep it simple:Nigeria and Nigerians’ money (or wealth) appears to be imaginary all the time, the ecommerce operators aren’t seeing the numbers, the telcos aren’t seeing them. Bank’s numbers are highly deceptive, because it’s possible that less than 10% of its customers are generating more than half of the revenues and subsequent profits.There is dearth of knowledge and awareness in the land, many people keep thinking that MTN and others are raking in huge (or even YUGE) profits, while forgetting the business environment, security, cost of doing business, and the disproportionate purchasing parity between the rich and the poor here.Huge population figures are only useful when the majority of the citizens are empowered, with decent standard of living and disposable incomes. The illusory belief that our numbers are huge potentials must cease, the country is simply nowhere in terms of productivity and purchasing power. The few wealthy people aren’t enough to compensate for the millions of poor people in the land.This is a country with annual budget of less than $30 billion, and we keep hearing that we are very rich. Simply, Nigeria is way below expectations!